The BIPRO-9004 is an indoor outdoor security camera with built-in infrared LEDs that enables IR night vision. This BNC security camera supports 3 different 1080p HD video formats: AHD, HD-TVI, and HD-CVI. It also supports analog CCTV video format (CVBS). This makes it compatible with just about all BNC DVRs. This surveillance camera has a 3.6mm lens. This is considered a fixed lens camera as it is pre-focused and will provide a 90 degree field of view. This camera’s view cannot be adjusted. This camera also has a cable through body mounting bracket. This is an additional safety feature as the video and power cable harnesses for this camera are completely sealed within the camera’s mounting bracket. It is also vandal resistant. This infrared night vision camera will allow for viewing up to 25 meters (80 feet). This is due to the 36 infrared light LEDs located in the front of the camera surrounding the lens. When the Infrared LEDs are engaged, the camera will provide a high quality black and white image. The Below images were captured using this surveillance camera in both the day and IR night vision mode. All of the lights were turned off in the room when we captured this image. All of the computer monitors and TVs in the room were also turned off so that there is zero light in the room. This image was captured in CCTV Camera Pros tech room with all of the lights on in the room. The camera is mounted in the corner of the room close to the ceiling. You can see how the 3.6mm lens provides a view of this entire room. 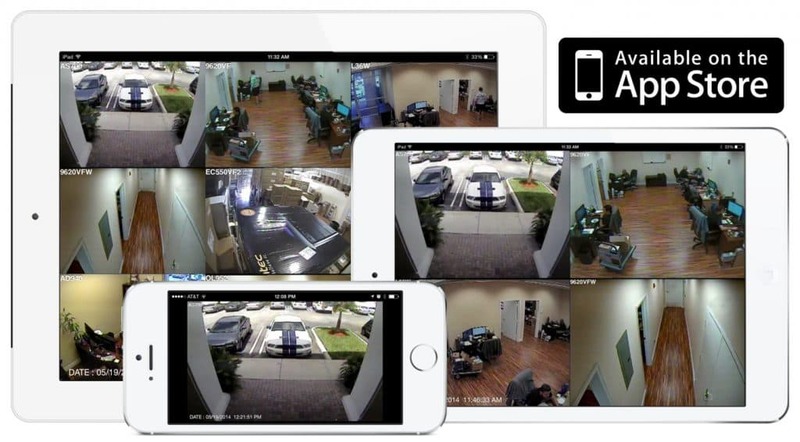 In order to view an analog based surveillance camera on a mobile device (PC, MAC, iPhone or Android), the user will need to connect the camera to a DVR with remote viewing abilities. 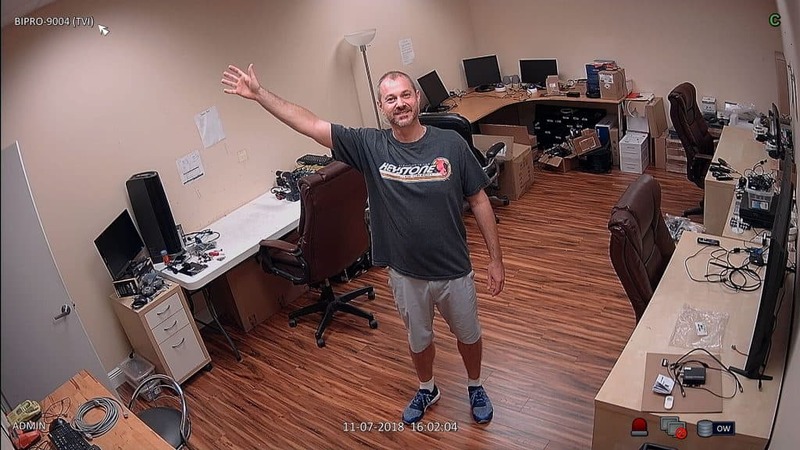 During our testing we connected the cameras to our iDVR-PRO HD Security camera DVR. In addition to providing a recording platform, the iDVR-PRO will allow for users to log into the system remotely to view a live camera feed as well as playback from remote locations. This is especially useful for people that are out of town or do not have the ability to always be in the same location as the DVR. You are able to view playback from MAC, PC, Android or iPhone devices. 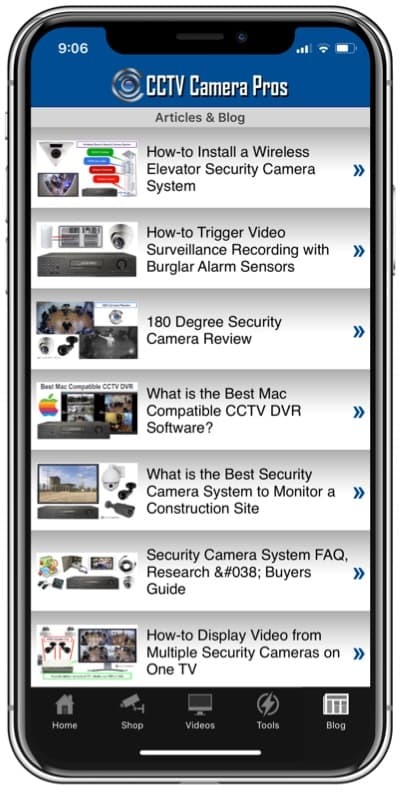 You can learn more about all of these remote camera viewing apps and software applications here. 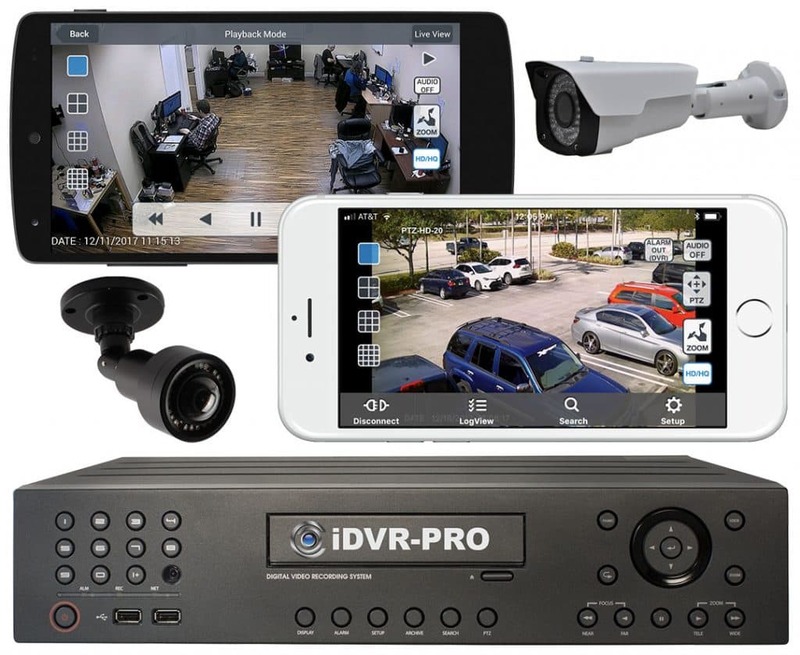 Unlike IP Cameras that allow for motion detection to be setup directly on the web interface, analog based cameras need to have the motion detection setup via the DVR interface. All the DVRs sold at CCTV Camera Pros allow for motion detection on analog based cameras. In order to setup the motion detection on an analog camera, we access the setup menu in the DVR. 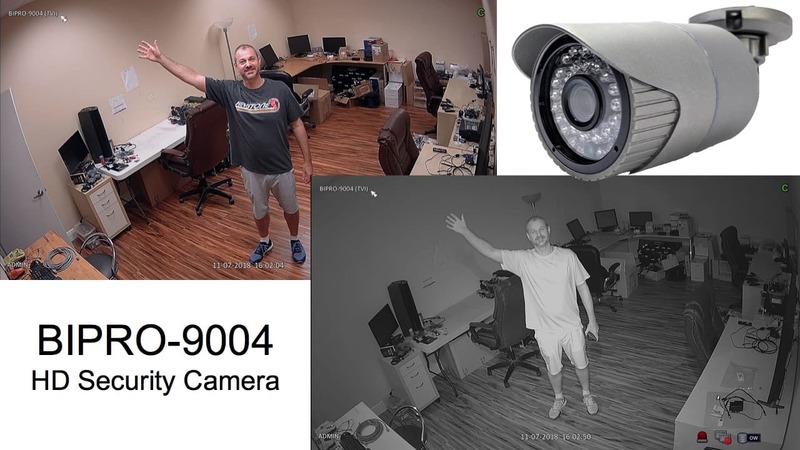 In the below image we used the iDVR-PRO DVR to setup the motion detection. 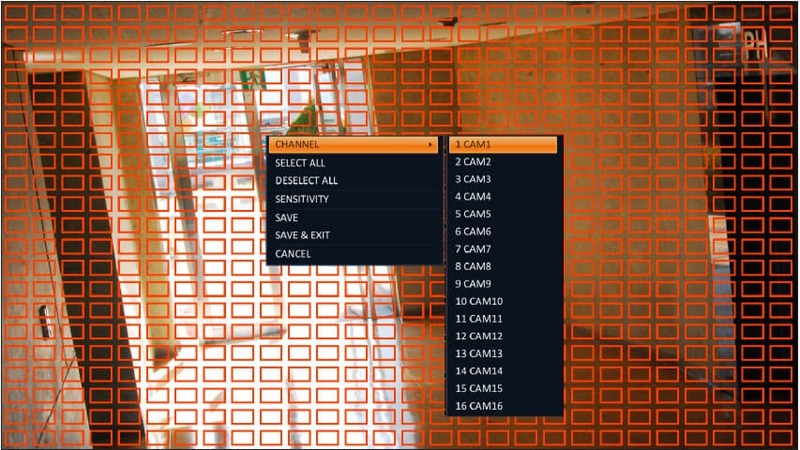 As you can see the DVR’s interface gives the user the option to select specific areas within an image to act as a trigger point for motion detection. Once setup in the DVR, the camera will trigger a motion activated event which in turn enables the recording feature on your DVR. Motion Detection setup will also allow the user to mask out areas of constant motion. For example an outdoor area with a large tree that triggers motion when the wind is blowing can be masked out to not act as a motion alert. What is the benefit of a IR camera? IR or Infrared are the small LED lights at the lens end of a surveillance camera. When the camera’s low-light sensor is triggered and the lens is unable to see a clear image, the IR LEDs will turn on and allow the camera to see in the dark. Cameras without IR LEDs are typically unable to see in complete darkness. What type of connectors does the BIPRO-9004 use? The BIPRO-9004 uses BNC connectors for the video transmission and 18 gauge power cable for power. What is a 4-in-1 camera mean? 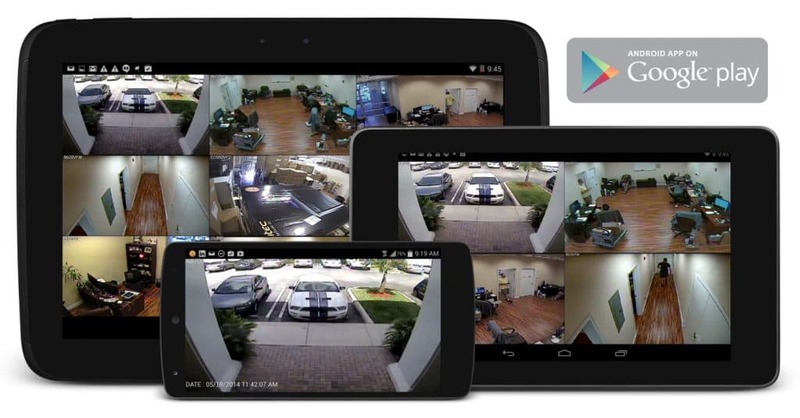 A 4-in-1 camera is a BNC type security camera that supports multiple video formats. The BIPRO-9004 supports 1080p resolution in AHD, HD-TVI, and HDCVI video modes. It supports 960H resolution (960 x 480 pixels) in analog CVBS mode. This camera requires 12V DC. It includes an individual 12 volt 500ma power supply. Installers can also use a multi-camera power supply box, which is more typical when installing more than one surveillance camera. What makes this camera indoor / outdoor rated? The BIPRO-9004 is enclosed in an IP66 rated weatherproof enclosure. IP66 rating means that the enclosure is “dust tight” and protects against powerful jets of water, rain, or heavy seas. Is this a wireless security camera? No. This camera requires a coaxial cable with BNC connectors. It does not have a wireless function. You can find the BIPRO-9004 home and business security camera here.